The Omega J8006 Nutrition Center Juicer is a low-speed single screw masticating type juicer. Operating at 80 rpm, it processes food at a much lower speed compared to other types of juicers that run at 1,650 to 15,000 rpm. This preserves healthy enzymes prevents oxidation. This means that juice can be stored, refrigerated, up to 72 hours. Owners: Legacy Companies, Fort Lauderdale, FL. The Omega J8006 is a heavy-duty juicer with multiple uses. It uses GE’s ULTEM plastic material in the auger, reportedly 8 times stronger than the plastic used in other machines. Parts are BPA-free and dishwasher safe. The low-speed of 80 RPMs ensures high nutritional values and longer lasting product without degradation. The powerful motor easily handles plant fibers and membrane penetration to extract vitamins, minerals, and enzymes. The Omega J8006 Nutrition Center Juicer has a dual-stage design. First, the fruit and/or vegetables are crushed and the juice extracted. Then, during the second pressing stage, the pulp is squeezed and ejected. This maximizes juice yield and leads to a drier pulp. It features a built-in reverse function to prevent clogging. Automatic pulp ejection into a pulp container allows for continuous juicing. A 15-year warranty, the industry’s longest backs up its claim “engineered to last a lifetime”. What Is The Omega J8006 Nutrition Center Juicer Used For? 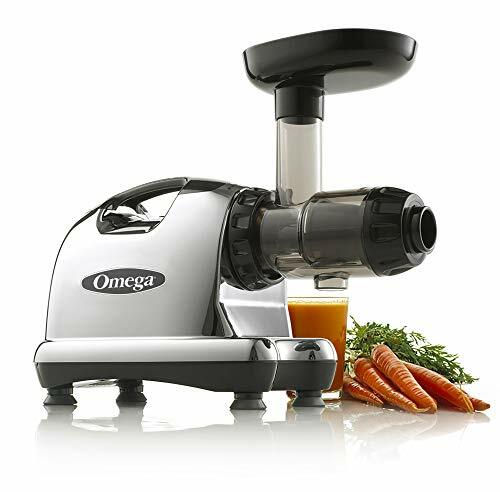 Who Is The Omega J8006 Nutrition Center Juicer For Or Not? This is a juicer for juicing followers looking to get the most out of their machine. The Omega J8006 Nutrition Center Juicer will make daily healthy juices from everything from wheatgrass and leafy greens to the hardest fruits and vegetables. It is heavy-duty and will last a long, long time. This is not your quick morning smoothie maker. Juicing takes more time to prepare fruits and vegetables and to slowly juice them to prevent damaging oxidation and nutrient loss due to heat. Caution is advised for diabetics or people watching their weight. Due to the high and easily digested sugar and high-calorie content in pure fruit juices, either combine vegetables and fruit together to dilute the sugar, make smoothies, or eat whole fruit for the fiber content. If this is not what you are looking for, read my Juicers page to learn more about other types and brands. Amazon customers give the Omega J8006 Nutrition Center Juicer an average of 4.4 out of 5 stars. 88% of the reviews are positive 4 or 5 out of 5 stars. Fakespot analysis discovered that over 90% of the Amazon reviews are high quality for a grade A rating. For dedicated juicers that want a machine that will give them its all-out best on a daily basis for a long time, I give the Omega J8006 Nutrition Center Juicer a 89 out of 100 and a recommended Buy. Do you have an opinion on the Omega J8006 Nutrition Center Juicer based on your personal experience that you would like to share? Leave it in the comments box below. If you have any other comments or questions please leave them below or email me at ed@smallkitchenappliancesforyou.com.